May the glorious intercession of the Virgin and Martyr Saint Lucy give us new heart, we pray, O Lord, so that we may celebrate her heavenly birthday in this present age and so behold things eternal. Through our Lord Jesus Christ, your Son, who lives and reigns with you in the unity of the Holy Spirit, one God, for ever and ever. 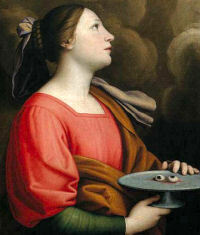 St. Lucy (283-304) was born in Syracuse, Sicily, where she also died. She was of a noble Greek family, and was brought up as a Christian by her mother, who was miraculously cured at the shrine of St. Agatha in Catania. Lucy made a vow of virginity and distributed her wealth to the poor. This generosity stirred the wrath of the unworthy youth to whom she had been unwillingly betrothed and who denounced her to Paschasius, the governor of Sicily. When it was decided to violate her virginity in a place of shame, Lucy, with the help of the Holy Spirit, stood immovable. A fire was then built around her, but again God protected her. She was finally put to death by the sword. Her name appears in the second list in the Canon. Today's feast can easily be harmonized with Advent themes. The very name Lucy pulsates with light, a living symbol amid the season's darkness (the days are now the shortest of the year). As a wise virgin Lucy advances with a burning lamp to meet the Bridegroom. She typifies the Church and the soul now preparing their bridal robes for a Christmas marriage. That the famous Sicilian martyr really lived may be deduced from the great popular veneration accorded her since most ancient times. The Acts detailing her sufferings, however, merit little credence. According to these she made a pilgrimage to Catonia with her mother, who suffered from hemorrhage, to venerate the body of St. Agatha. After praying devoutly at the tomb, Agatha appeared to her in a dream and consoled her: "O virgin Lucy, why do you ask of me what you yourself can procure for your mother? For your faith too has come to her aid and therefore she has been cured. By your virginity you have indeed prepared for God a lovely dwelling." And her mother actually was healed. Immediately Lucy asked permission to remain a virgin and to distribute her future dowry among Christ's poor. Child and mother returned to their native city of Syracuse, and Lucy proceeded to distribute the full proceeds from the sale of her property among the poor. When a young man, to whom Lucy's parents had promised the virgin's hand against her will, had heard of the development, he reported her to the city prefect as a Christian. "Your words will be silenced," the prefect said to her, "when the storm of blows falls upon you!" The virgin: "To God's servants the right words will not be wanting, for the Holy Spirit speaks in us." "Yes," she continued, "all who live piously and chastely are temples of the Holy Spirit." "Then," he replied, "I shall order you put with prostitutes and the Holy Spirit will depart from you." Lucy: "If I am dishonored against my will, my chastity will secure for me a double crown of victory." Aflame with anger, the judge imposed the threatened order. But God made the virgin solidly firm in her place and no force could move her. "With such might did the Holy Spirit hold her firm that the virgin of Christ remained immovable." Thereupon they poured heated pitch and resin over her: "I have begged my Lord Jesus Christ that this fire have no power over me. And in testimony of Him I have asked a postponement of my death." When she had endured all this without the least injury, they pierced her throat with a sword. Thus she victoriously ended her martyrdom. Patron: against hemorraghes; authors; blind people; blindness; cutlers; dysentery; eye disease; eye problems; glaziers; hemorraghes; laborers; martyrs; peasants; Perugia, Italy; saddlers; salesmen; stained glass workers; Syracuse, Sicily; throat infections; writers. Symbols: Lamp; dagger; three crowns; cauldron; two oxen; stake and fagots; cup; sword through his neck; poniard; ropes; eye held in pincers; awl; cord; eyes on a dish or book; swords. Often Portrayed As: Woman hitched to a yoke of oxen; woman in the company of Saint Agatha, Saint Agnes of Rome, Barbara, Catherine of Alexandria, and Saint Thecla; woman kneeling before the tomb of Saint Agatha. Choose one of the customs for St. Lucy's feast and try it with your family. See Celebrating for the Feast of St. Lucy, Swedish Lucia Feast, and St. Lucia Devotions. Select one of the recipes for this feast to prepare. Here is a recipe for cuccia, an Italian dish. This is another version. Say a prayer to St. Lucy for those who are physically and spiritually blind. Read the Life of St. Lucy taken from Ælfric’s Lives of the Saints written in the 10th century. For St. Lucia Swedish resources, see Hemslöjd. Especially recommended are the St. Lucia's Crowns, either plastic to wear or brass for display, the books Lucia, Child of Light: The History and Traditions of Sweden's Lucia Celebration and Lucia Morning in Sweden.